This week in Camden County and across the state of Missouri, municipal elections are taking place to determine the make-up of school boards, fire protection districts and a flurry of bond/levy issues. In Camden County, these election issues are being decided under the long shadow cast by attorney Charles McElyea. Charlie Mac, at a meeting of the MCFPD earlier this year. Charlie Mac tried to explain the closure of outlying stations in the district wasn’t part of a shakedown attempt after the levy failure in November. The incestuous influence of Charles McElyea, partner at the law firm of Phillips, McElyea, Carpenter and Welch, over Camden County government is undeniable. McElyea is the attorney for Camden County, as well as the Mid-County fire district and lists the Camdenton school district as a client. He is an incumbent on the Mid-County fire board, former member of the Camdenton school board, former member of the Lake Regional Hospital board and registered agent for Kids Harbor in Camdenton. Recently, McElyea’s decision to suspend Sunshine Law and issue threats and concerns of lawsuits in order to hide his billing records, has placed him in the spotlight in the Lake of the Ozarks community. McElyea’s legal ‘advice’ as Camden County attorney has also been called into question by Second District Camden County Commissioner Cliff Luber. In a meeting of the Camden County Commission earlier this month, Kris Franken referenced McElyea’s legal ‘opinion’ in attempting to defend his own disregard for law in an attempt to ram through a unilateral re-write of the ULUC’s Article 800. Nor was this the only questionable opinion offered by McElyea regarding Camden County Planning and Zoning. He also ‘justified’ tens of thousands of dollars of legal fees, wracked up during the tenure of former P&Z administrator Don Hathaway. McElyea did this by giving his ‘legal opinion’ regarding investigating anonymous complaints. McElyea, in spite of the ULUC’s specific requirement that complaints be both signed and notarized before an investigation began, gave the legal opinion that the ULUC ‘didn’t say you COULDN’T investigate anonymous complaints’. This ‘opinion’, contrary to the letter of the ULUC, cost the taxpayers of Camden County thousands, as attorneys flocked to county coffers, taking their bites one invoice at a time. On March 18, 2014, after having set up an appointment the previous week, I went to the Camden County Clerks office to view the billing records of Charles McElyea, the Camden County Attorney for the year 2013. I filled out the appropriate request paperwork and was given the file and a place to sit and review it. During the course of this review, the door to the County Clerks office burst open and Rowland Todd, the County Clerk, took the files from my hands while bellowing out “if you post any of the pictures you took (of those public records I was reviewing) to the internet, Charles McElyea will sue you!!”. I was alarmed by this large, red-faced man threatening me with a lawsuit by the County Attorney with regard to the Public Record of his billing statements. In my opinion, having been Camden County Attorney for many, many years Mr. McElyea should have been aware of what information his billing records contained and conformed them properly or let the clerk know what was NOT public record under the law. Mr. McElyea now contends that he did not threaten me, even though there were several witnesses to this threat. He either threatened me, a taxpayer who went through proper legal channels, for viewing public records or he threatened the county which would represent a conflict of interest to his continued employment by said county. I was contacted by a representative of the State Attorney Generals office regarding this matter. It would seem Mr. McElyea was so concerned at what my reaction might be, he CALLED that office the very next morning to tell them that I was lying!! I had not even registered a complaint over the issue with that office! In addition, I have found that our Planning & Zoning Commission and our Board of adjustment are seated illegally and have been for SIXTEEN YEARS!! We were a Third Class county in 1994 when the voters voted in Planning & Zoning. In 1998, we became a First Class county. The ULC was not adopted until June of 2004. According to rsMO 64.120, the Board of Adjustment is to be made up of the County Commissioners. According to rsMO 64.020, the Planning & Zoning Commission is to have one County Commissioner (64.020). This means ANY decisions that have been made by these boards have been illegal and therefor subject to lawsuits should the aggrieved parties wish to pursue this course of action. In an e-mail dated 2/19/2014 the County Commissioners were made aware of this concern. Mr. Luber stated that Bev Thomas told him that Charles McElyea had said that because we had been a Third Class county when we voted in Planning & Zoning that this was legal & proper. However, according to rsMO 48.050, Any office which may be established as a result of the change of the county from one class to another shall be filled in accordance with the provisions of the law relating to the filling of vacancies for such office. Mr. McElyea should be reprimanded and heavily fined (with the fine going to a general legal relief fund for the taxpayers) at the very least for his conduct and, I personally feel he should be dis-barred as his actions were deliberate and a man with his years in this field should be well aware that what he was doing was illegal. He has stated he “is to advise the County Commission and office holders on ways not to get sued.”; he should certainly know that threatening taxpayers for viewing public record OR the county he is employed by that this is certainly NOT a way to avoid a lawsuit; nor is allowing an illegally seated board or commission to continue for SIXTEEN years!! Certainly Mr. McElyea’s behavior is NOT commensurate with what we expect from our County Attorneys who, in my opinion, should be held to a higher standard of ethics and behavior. The behavior described in this complaint is precisely the behavior that McElyea promises to bring to Camden County government and the Camdenton school district. This behavior is steeped in historical fact and is highlighted by a recent shakedown attempt by the Mid-County fire protection district, under McElyea’s purview. In January of this year, the Mid-County fire protection district announced plans to close three satellite fire stations. The board, chaired by McElyea, also unveiled budget cuts that included selling equipment, restructuring holiday and overtime pay and the elimination of the fire inspector position. These moves, it was explained by McElyea, were in response to the failure of a tax levy proposed in 2013. A 12-cent levy proposal was soundly defeated by voters in November of last year, by a margin of nearly two to one. Many residents looked at the closure of the satellite station as retributive in the wake of the levy’s failure. Closing outlying stations, #3 on State Road AA, #5 on Old South Highway 5, and #6 on State Road D, would force many households to pay higher insurance rates. This is based on the distance between a given home and the nearest fire station. Residents outside of a five-mile radius would be exposed to higher rates. Closing these three satellite stations would therefore increase insurance costs to hundreds of lake area homes. The steps presented by the fire board in January were seen as an affront to some taxpayers in the fire district. Stacy Shore, resident in one of the areas affected by the proposed station closures, questioned the fire board’s decision to purchase a property on Pier 31 road. This purchase was for a future fire station and cost approximately $50,000. While this purchase was made with a bond for capital expenditures, it still raises several questions among members of the community who believe that other options should be considered before closing fire stations. Also an issue of contention: the $14,000 price tag incurred by the fire board to fund efforts during November’s levy initiative. 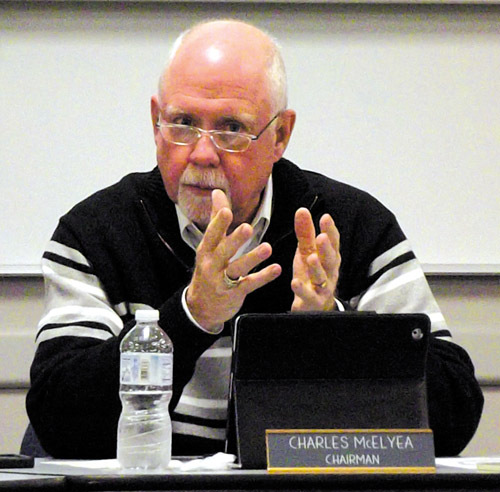 Claims of being “fiscally conservative” were offered by McElyea during the January meeting, but for many residents, these claims fall on deaf ears. They point to the administrative costs as being out of line with the operation of the fire station. To these residents, bringing those costs down would allow the protection district to invest more in the wages of front-line firefighters and keep the threatened stations open. The Mid-County fire protection district and its board, after hearing the public outcry in January, attempted to use this civil unrest as a vehicle to launch yet another campaign to raise the fire levy. Most observers believe that this was foolhardy on the part of McElyea and the district. One candidate in this week’s Mid-County fire board election offers an alternative to the ‘screw you, pay me’ philosophy espoused by McElyea and the MCFPD. Jeremy Rugen’s slogan: “One name. One vote.” is resonating throughout Camden County in response to ‘business as usual’. Jeremy Rugen has a different perspective on how to achieve financial solvency without cutting services and raising the current levy. I believe the district severely needs overall budget accountability. Some of the trucks and equipment that are currently owned is not needed to provide service or to maintain insurance standards. I feel in our country today our government does not prioritize spending and wastes tax dollars. I don’t feel it is okay for our government or the fire board to do the same. I believe that if you have $2 you cannot spend $3. In my budget at home I cannot spend more money than I have in my account. My goal is to eliminate unneeded vehicles and equipment. I want to prioritize spending and have a complete audit performed. Once this is complete, I can determine more accurate needs of the district. The district will need a operational increase to create truck replacement program and air pack replacement program. The issue I have with the current levy is these two issues are not being addressed and will not solve the budget problem. I would like to see the district balance the current budget and wait until 2017 when the bonds are paid off. This will take the current amount the tax payers are paying for the bond and place it into the operating account. This will require a vote from the tax payers. This will be no tax increase. I am committed to stopping the current wasteful spending. I believe with budget cuts the budget can be balanced until 2017. The district has very little in reserves and this will not be easy task, but I am up for the challenge. 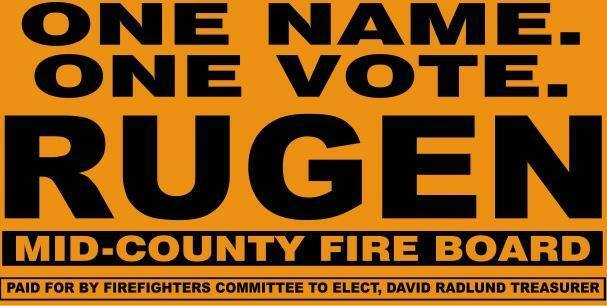 His campaign slogan of “One name, one vote” distinguishes Rugen as a candidate who stands against the mobster tactics used by MCFPD in recent months and is a stark contrast to the reign of McElyea. Tomorrow from American Spring: Two Elections, One Lawyer Part Two…. Stay tuned to http://www.americanspring2011.com for the very latest in news from Camdenton to the Congo. Follow on Twitter @AmericanSpring or on the Facebook page Guerrilla Radio with American Spring. Guerrilla Radio is on Monday through Friday from noon until two in the afternoon. Tuesday’s Prime Time edition of Guerrilla Radio is live at 8. All shows are archived on line for easy access. This entry was posted in American Spring Original Articles/Opinion, Camden County Commissioner, Camdenton School District, Kris Franken, Local News, Local politics, Planning and Zoning by americanspring2011. Bookmark the permalink.